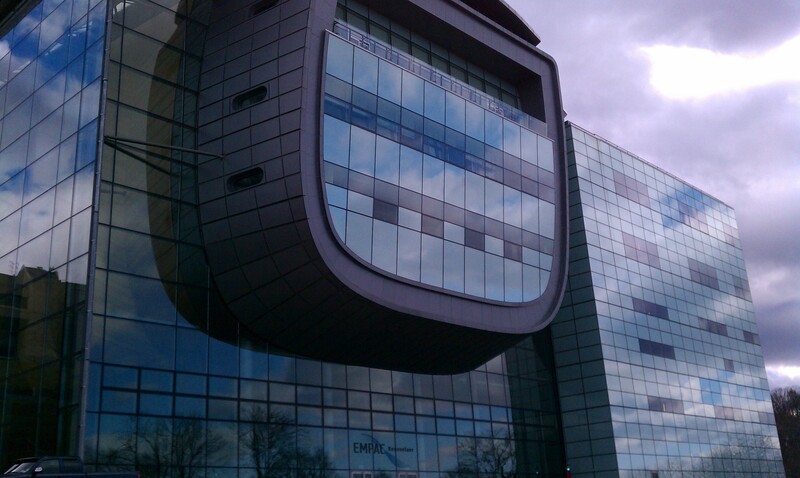 I had the pleasure a few weeks ago to visit EMPAC, or Experimental Media and Performing Arts Center, in Troy. I first went to EMPAC to see Grant Imahara from Mythbusters when he came to speak last year. I was taken back by how beautiful the building was. Sure, it’s great to sit in an old standard theater like the Palace or Proctors. I feel, though, for a place that focuses on Experimental Media that the building should look more like EMPAC, well done architects! The building construction broke ground in late 2003 and was completed in late 2008 as part of Rensselaer Polytechnic Institute (RPI). EMPAC isn’t just the main theater that can be seen through the clear walls but also two studios and another theater. 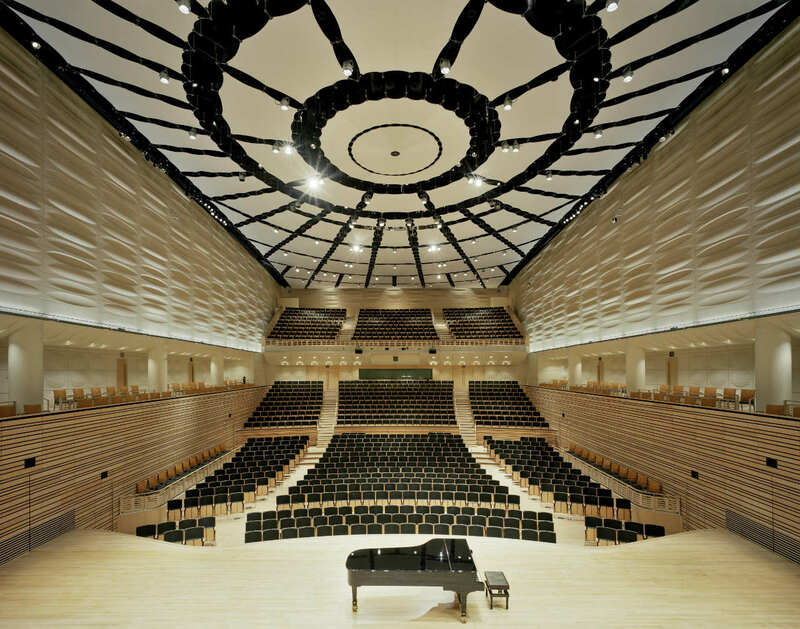 The main concert hall has seating for 1200 and at one point the large projection screen on stage was the largest in the world but may not necessarily be so anymore. Either way, that’s a pretty large feat even if it comes in the top 5. As a radio nerd, I took a look at the sound board and it was way more high-tech than anything I’ve seen before. The speaker series that I saw is probably not even the beginning of the capabilities of that theater. The walls are designed to acoustically project the sound all around instead of from just in front coming from the stage. That way you feel as if you’re a part of the performance instead of just a spectator which from what I’ve been told, is important with the types of art that comes through there. Honestly, this theater is something you have to walk through and experience and not just take my word for it. Elsewhere in another part of the building is another, smaller theater that seats about 400 and is capable of people hanging from the ceiling, which I found interesting because of its height. What I liked most about this theater is that the stage and the audience are on the same level so that if you’re sitting in the first few rows, it’s as if you’re on stage with the performers, part of the production. Along with the two theaters are two studios that also hold smaller performances. Studio 1 (The Goodman) and Studio 2 without a performance just look like blank black boxed rooms but just imagine the possibilities an artist can have with all of that empty space and perfect acoustics. The most interesting element was the 360 projection screen. In the middle of the room is a circular screen which allows people to sit around it as well as inside of it. I wasn’t able to see the screen put together since it was on its way to Brazil when I visited but with the frame still in tact, I could get the jist. In order to film something to be played on this screen, you need not only special cameras but special microphones to be able to capture not just the sound but where it’s coming from to play it from the proper direction. Each studio and theater space has a great feel to them, that’s a little hard to explain. I’m an arts nerd so anything to do with theater or music or film has my complete attention (just in case it wasn’t projected enough in my post). I love most that the building as a whole is visually appealing and not just the respective internal spaces. If you find yourself driving through the RPI campus, it’s hard to miss EMPAC. The clear window-walls create natural light during the day and project its internal light at night. Since I visited around lunchtime, I went to Evelyn’s Cafe. Evelyn’s is open weekdays 11AM-2PM featuring a rotating menu using locally-sourced ingredients including vegan options. The meal I had isn’t on the menu for March but honestly anything they have there sounds and looks delicious and their menu is available ONLINE. I don’t see it possible going wrong with anything you order. 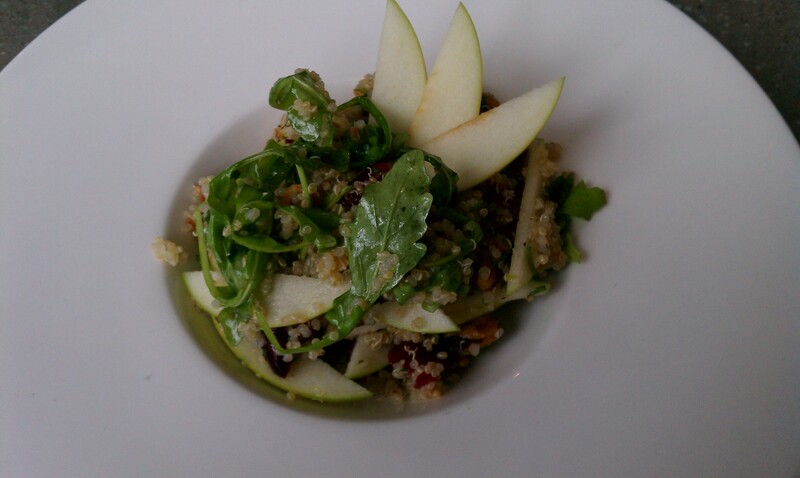 I ordered a Quinoa Salad with craisins, arugula, apples and a fresh light dressing. Not only was the meal delicious but beautifully plated. The lettuce and apples were both crisp and fresh and though the serving size looking small in comparison with the plate, it was actually quite filling. Everything on the menu is very reasonably priced. I believe when I was there they had a Kobe burger for $8-9 which is impressive and I bet a best-seller on a college campus. I really enjoyed my time at EMPAC and everyone was very accommodating to answering all of my nerdy questions. I felt as if I was just in continual awe throughout the entire tour. I can’t wait to see a performance there to get the entire theater experience. They have a lot of great things coming up, give their schedule a look and take in this beautiful building and the great art inside, for yourself. A special thanks to everyone at EMPAC, Jason especially, for being so kind in giving me a tour of your wonderful facility and answering all of my questions and thanks also to everyone at Evelyn’s Cafe for the delicious food and your gracious hospitality!